1. Drawings and photographs by Friends of St. Cecilia's Hall, University of Edinburgh. 2. The Russell Collection of Early Keyboard Instruments, Edinburgh University Press. The original instrument made by J. Ruckers has a single 8'register and the upper manual was so called a transposed keyboard. Presently it is kept in the Russell Collection of the University of Edinburgh. Making an exact replica was not the original purpose but effort was focused to reproduce its tone character. The upper manual was made as a parallel, not the transposed, keyboard. Since building an exact replica was abandoned, further deviations, including double 8' register with a full chromatic, instead of short octave, keyboard, Peau de buffle and Nazard Lute, were made. Because of these additional features, historically it does not possibly exist in both geography and periodization points of view. 1. Drawings and measurement notes by Grant O'Brien, published from The Friends of St. Cecilia's Hall and The Russell Collection of Harpsichords. 2. Photographs by The Friends of St. Cecilia's Hall and The Russell Collection of Harpsichords. 3. The Russell Collection of Early Keyboard Instruments, Edinburgh University Press. 4. 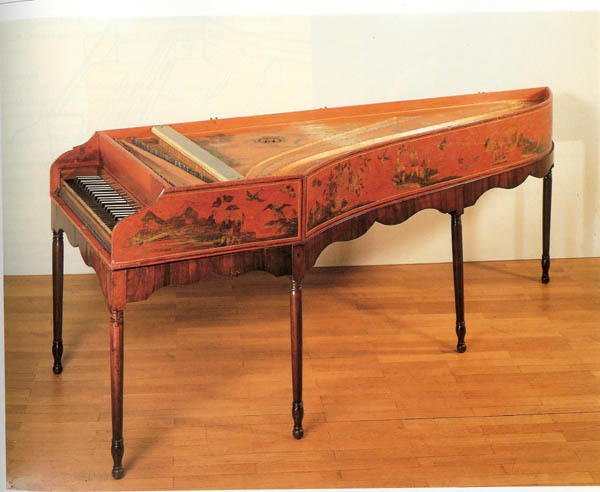 18th Century French Harpsichord by Frank Hubbard, as an instruction manual for a kit. This instrument has been in The Russell Collection in Edinburgh, since it was brought there in 1952. It had been restored in 1882 by Louis Tomasini, whose inscription is seen on the restplank. After this restoration, Erards borrowed it and copied. This is assumed to be the start of modern harpsichord making. Presently, the original instrument is in Schloss Charlottenburg, Berlin. 2. Ｋｉｅｌｋｌａｖｉｅｒ; a catalogue for collection of harpsichords and virginals at the Staatliches Institute for Musikforschung Preussischer Kulturbeisitz: edited by John Henry van der Meer, Martin Elste, Gunther Wagner and written by: Harst Rase, Dagnar Draysen-Reber. Special thanks to Ms Sabine Hoffmann, the restorer and Mr. Bernd Wittenbrink, the librarian of the Staatliches Institute for Musikforschung Preussischer Kulturbeisitz for their kind support of providing an opportunity to closely study the original instrument and copies of literatures and records of researches on the original instrument. The original instrument is now in the Staatliches Institute for Musikforschung Preussischer Kulturbeisitz in a playable condition. Besides this harpsichord, 5 clavichords by Johann Christoph Fleischer are preserved. However, this is the only one extant harpsichord made by J. C. Fleischer. Pine is used in a whole structure. The soundboard has a cut-off bar and ribs are placed between the cut-off bar and spine, parallel to te belly rail. In the 1971 restoration, other ribs are added below the 8' bridge, like ones often seen in German harpsichords. Respecting the restration, this replica also employs these ribs. 4' hitchpin rail is about 4 Cm thick. Now, the original instrument has a 2 Cm thick reinforcement member on top of this thick hitchpin rail. However, this replica has no such reinforcement. The registers are 8', 8' and 4' from the front to the back. As mentioned above, there is only one set of 8' strings. The two 8' registers are to provide a contrast in tone color with two different plucking points. It is not like a slanting jack rail often seen in German harpsichords, typically by Hans Muller as a riverhead. Difference in distance of the two plucking points is about 2 centimeters in a whole compass. It is, however, enough to produce clearly different tone characters. It seems to be an intended effect to use the both registers at a time to make tones containing less harmonics somewhat like virginals. Another feature needs to be mentioned is there is no damper on the 4' jacks. Original instrument made by Ridolfi is preserved at the Smithsonian Institution, Washington DC. 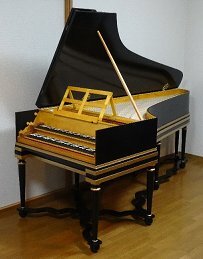 A number of other instruments, having similar features and structures, were also made in the same period in Italy and this model can be assumed as one of the typical style of this kind. Brass strings are used in the whole range and the tension of the strings is generally lower that that of ones made in other countries in Europe. Material of the spine, bent side is about 4mm thick cypress. Due to this thin and lightly structured body, the weight of the instrument is much lighter than those of Flemish and French, which are commonly used in concerts. This light weighted structure contributes to produce crisp and fast decaying tone characteristics. Usually, this type of instrument is used in a heavily embellished outer case. However, as the entire body, as well as the sound board, vibrates and helps to produce sound, no such outer case was made and it is just put on a simple stand.